In El más crudo invierno, his book-length meditation on seven lines by Peruvian poet Blanca Varela, Mario Montalbetti (Lima, Peru, 1953) cites and glosses Agamben’s definition of poetry as “the suspension and exhibition of language.” What is suspended in a poem, he explains, is primarily language’s referential function, its arrival at a point of meaning purportedly situated outside itself; in his view, a poem is not a use of language, but “language as such, stripped of use-value.” Not a port of arrival but language’s perpetually failing motion towards it, illuminated by its interruption. 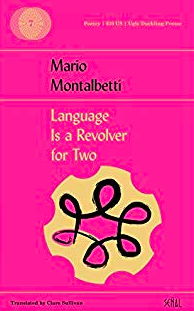 Montalbetti’s own work, widely acknowledged as one of the most significant interventions in contemporary Latin American poetry, has sustained over the course of four decades a brilliant exploration of that gap, of that absence: it is rooted in an awareness of the inescapable dysfunction at the core of our linguistic acts, and in a concept of the poem as, ultimately, a moment of resistance to it. Language Is a Revolver for Two, expertly translated by Clare Sullivan and brought out by Ugly Duckling Presse as part of its Señal series of bilingual chapbooks, serves as an excellent introduction to Montalbetti’s poetry for English-language readers. Originally published in Spanish in 2008, this brief collection (14 poems, none occupying more than a page, most much shorter) keeps a sharp focus on the central philosophical issue outlined above while displaying many of the elements that have garnered for Montalbetti’s oeuvre the appreciation of critics and readers throughout the Spanish-speaking world: its sharp-cut intelligence, its verbal playfulness, its sense of humor and its relentlessly ironic stance. Above all, it reveals—perhaps most singularly among the author’s 10 published books of poems—the melancholy humanism that undergirds Montalbetti’s conceptual project. A language we don’t know borders Peru to the east. A 350,000-ton freighter borders Peru to the west. borders Peru to the north. A quick dash borders Peru to the south. The notional space generated here, less geographical than economic and cultural, is anchored in the idea of the border as a limit or constraint (in Spanish, the noun is límite and the verb limitar), which the translator efficiently emphasizes by rendering to border not as something that Peru does, but as something that is done to it. Thus, that 350,000-ton freighter to the west, where real-world Peru meets the Pacific Ocean, inscribes resource extraction as one of the country’s “limits.” Meanwhile, the port of Chimbote—a major hub for the Peruvian fishing industry in the 1970s and a symbol of the era’s dreams of development, greatly decayed since then—is actually not north of Peru but north of Lima, and this distinction is critical. What Montalbetti seems to be outlining is not a map of Peru as such but a map of Peru as seen from its capital city, and more specifically, as seen by the city’s elites, those who dash quickly to the south (the beach, in the local geography) at the first opportunity. The “language we don’t know,” then, is not—at least not unambiguously—the Portuguese spoken in Brazil, real-world Peru’s eastern neighbor, but the Quechua and Aymara of indigenous Andean peasants as well as the 140 tongues of the peoples of the Amazon River basin, all to the east of Lima. This ignorance, this lack of mastery (in the original, Montalbetti uses the verb dominar, with much louder political resonances), is yet another “limit” for the imagined country. To the question how much have you loved? as if the wine had run dry. Say you’ll go fetch some more. upon the vile kitchen grinding stone. from what is yours. It’s yours. The insufficiencies of language in the face of a rather rhetorical and unanswerable question about the subject’s emotions prompts a flight into the real, a move towards the objective presence of a fish waiting to be prepared for consumption. Yet, what is the knife that the subject is instructed to wield, if not language itself? At the surface level of the sentence “divide what is yours from what is yours,” that very division is operated by a word (“from”), and the final “It’s yours” appears as precisely the fragment severed by the blade per the poem’s command. This is not just a display of technical expertise. Here, that surface level is all that exists, nothing lurks behind it, and words themselves are meaning; even more to the point, they are the only available response to the incalculable issue of the speaker’s inner life. Every poem ends the same way. that wasn’t in the charts. the smell of something scorched consumed by fire. But not a word survives. Ultimately, then, words are consumed in the wreckage of the poem, but the end is not silence. Something does persist after the encounter with what “wasn’t in the charts,” even if it’s only a random collection of fragments, ruins, and traces of experience. Moreover, this very disaster is offered by Montalbetti, not as a failure of the poetic act, but as its goal: to short-circuit language, to reduce it to its bare essentials, and to say the least that can be said, which is—as the author puts it in “Excuse Me, Is This the Smoke Shop?”—the only way we have left to say something. Peruvian poet, critic, and translator Jorge Frisancho was born in Barcelona, Spain, in 1967. He is the author of four poetry collections: Reino de la necesidad (Lima, Asalto Al Cielo Editores, 1989); Estudios sobre un cuerpo (Lima, Editorial Colmillo Blanco, 1991 and Tranvías Editores, 2008); Desequilibrios (Lima, Universidad Católica, 2004); and La pérdida (y otros poemas) (Lima, Paracaídas Editores, 2014). His work has appeared in numerous anthology collections published throughout Latin America, Spain, and the US.